Additional Fields may be configured for certain pages with Sales User for Employee Portal. Details can be configured for specific pages/sections of Sales User, as described below. In SAP Business One, go to InterConnect Manager AddOn > Manage Additional Fields. Select Employee Portal from the Portal drop-down (marker 1 below), and the desired Page (marker 2 below). Select Employee Portal from the Portal drop-down (1) and the page (2). Add a new field (3) or edit an existing field (4). Add a new field using the + icon (marker 3 above), or update an existing field using the golden arrow (marker 4 above). From the Edit field screen, configure the field’s details, as outlined below. For specific use cases and examples, see the Examples section. Set basic details (1,2), Default value settings (3-6), Properties (7-12), Active (13). Label (1) This web label is displayed to the user. For hidden fields, this is an admin-only label. Standard - Allows a user to choose a value for this configured field. This value is saved in B1. Read-only - A value is displayed to the user, but the user may not edit it. “Default Value” settings must be configured to ensure a value is assigned to this field. This value is saved in B1. Display-only - A value is displayed to the user, and it appears as a non-editable note. “Default Value” settings must be configured to ensure a value is displayed. This value is not saved in B1. Hidden - This option is not displayed to the user. “Default Value” settings must be configured to ensure a value is assigned to this field. This value is saved in B1. Default Value: Use a query to provide a Default Value on web? (3) If enabled, a Query Category (4) and Query (5) must be selected. Default Value is assigned to the field on the web. Depending on other settings, the user may or may not be able to edit this value. Default Value: Default Value Query Category (4) This selects the B1 Query Category that contains the customized Default Value query. Default Value: Default Value Query (5) This selects the customized B1 Query used to determine the default value. This query may optionally use the parameters [%CardCode] (the currently selected Business Partner’s CardCode) or [%UserID] (the currently logged in user’s Employee ID - OHEM.EmpID). This query must supply a single row with a single column containing the value desired. Default Value: Default Value (6) If a query is not used, a hard-coded default value may be assigned here. If blank when “Use query” is un-checked, no default option will be provided on the web. Properties: Field Name (7) Any UDF and a sub-set of core fields may be selected, depending on which page and section is being configured. Properties: Use a query to provide Valid Values on web? (8) If enabled, a Query Category (9) and Query (10) must be selected. Valid Value options appear as a drop-down on the web, so the user can only enter valid options. Properties: Valid Values Query Category (9) This selects the B1 Query Category that contains the customized Valid Values query. Properties: Valid Values Query (10) This selects the customized B1 Query used to determine the list of valid values. This query must supply a list of value/label pairs. These value/label pairs will be used to display a dropdown of valid options for Standard Additional Field Types. For Read-only Additional Field Types, these value/label pairs will be used to display the associated label for the automatically assigned value. The value/label pairs in this query must align with all possible default values. In the event that a default value is not included in this query, the default value will be displayed “as is”. Properties: Is Required? (11) When enabled, this forces the user to select/enter details for the configured field. This may be combined with default values where appropriate, or default values may be left blank to force user action. Active (13) If enabled, all users with access to the configured feature will see this option. Recycle the IIS Application Pool for Employee Portal. This will ensure the latest fields are refreshed immediately for all users. See Troubleshooting - How to recycle Application Pools for a walkthrough. At this point, users will be able to see the configured fields by accessing the relevant Sales User feature. The following examples provide walkthroughs of setting up common scenarios. An implementation may require slightly different configuration options, see details above for available options. In this scenario, an employee needs to change the warehouse assigned to the order line in some cases. For example, if there’s a surplus of a product in the non-default warehouse, the employee can choose that warehouse instead of the default. A query to select a default warehouse. In this example: B1WebAPI_SU/Custom_DefaultWarehouse. This query may optionally use the parameter [%CardCode]. A query to list available warehouses. In this example: B1WebAPI_SU/Custom_WarehouseList. This query may optionally use the parameter [%CardCode]. This query must supply a list of value/label pairs, which will be displayed as a dropdown of valid options. 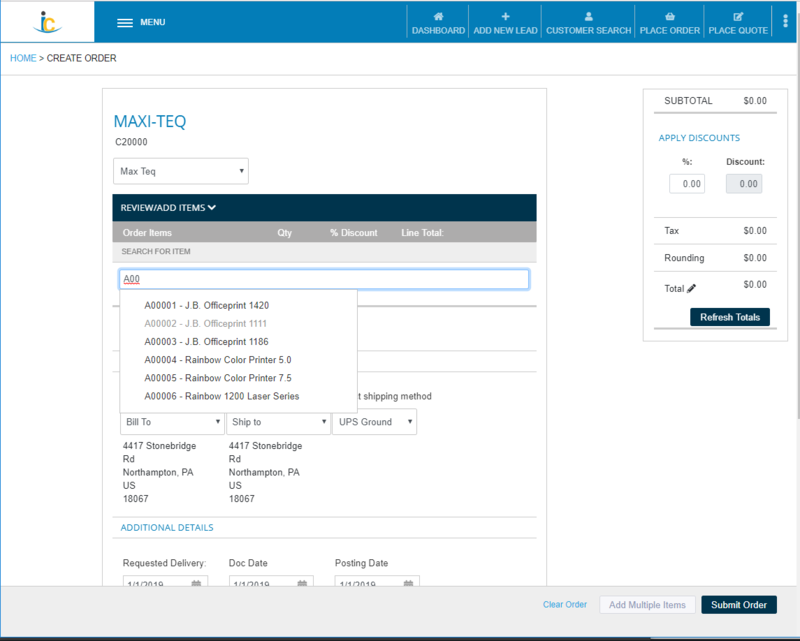 Select Employee Portal > OrderPad - Order Lines from the drop-down (see markers 1 & 2 below). Add or update the Warehouse field (see markers 3 & 4 below). 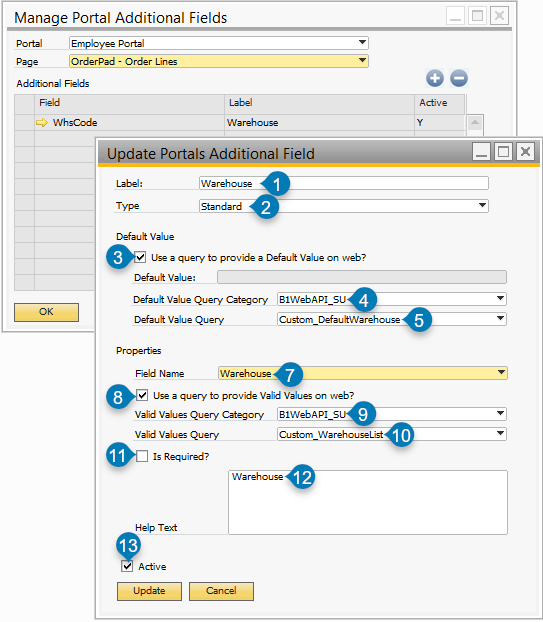 Select the Portal (1) and Page (2); Add a new field for Warehouse (3) or Edit it if it already exists (4). Assign web Label (1), Type (2), Default options (3), general Properties (4). Ensure the field is active (5). Label (1): Set this to Warehouse. Properties (4): In this example, we are using the line-level warehouse field, with a customized list of available warehouses. 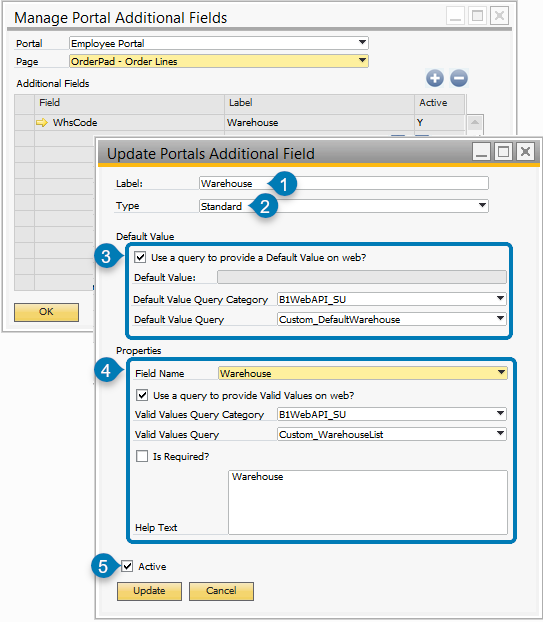 Select the field Warehouse, ensure the Valid Values option is enabled and select the customized query created in the first step: B1WebAPI_SU/Custom_WarehouseList. Active (5): Enable this option to display the field on the web. 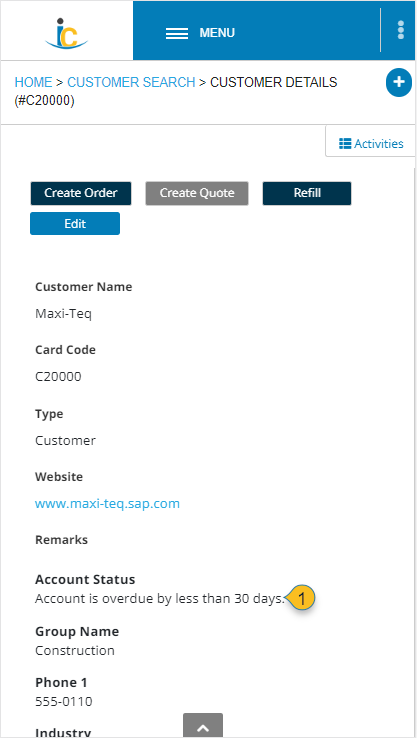 To edit the field on the web, log into Employee Portal and add an item to an order. Add an item to the order. When prompted, select the desired warehouse. 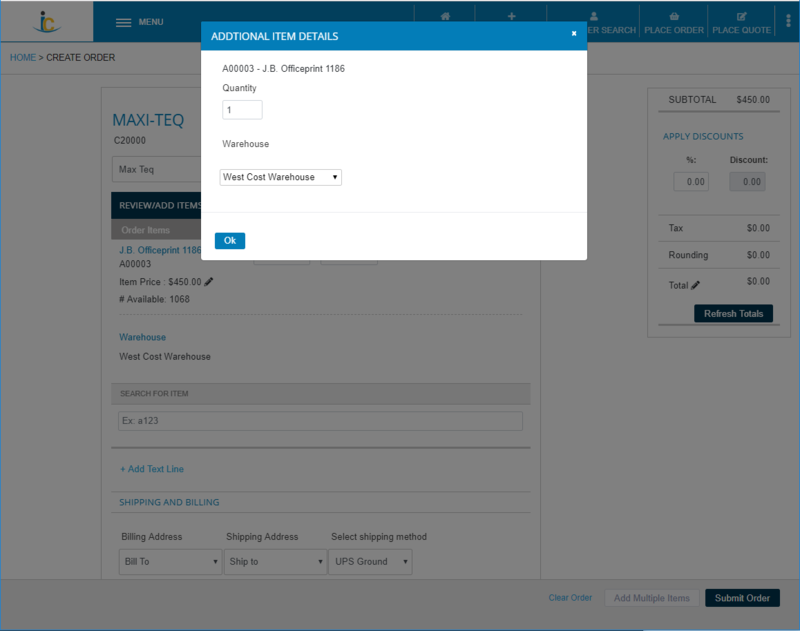 The default and available warehouse options are supplied by the custom queries. Select the desired warehouse from the available options. Submit the order. Note that the selected Warehouse is saved to the line, as selected by the user, shown with marker 1 below. 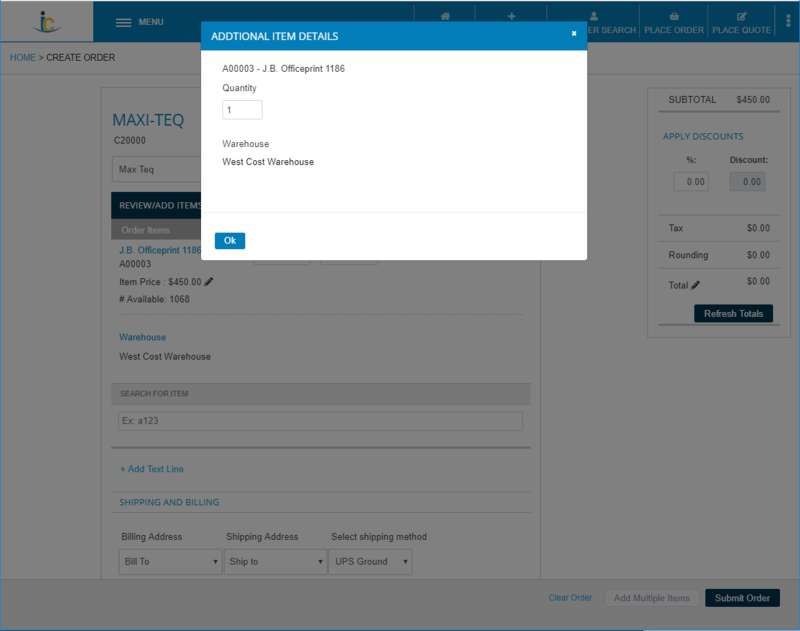 Once the order is submitted, the selected warehouse is displayed on the order summary (1). 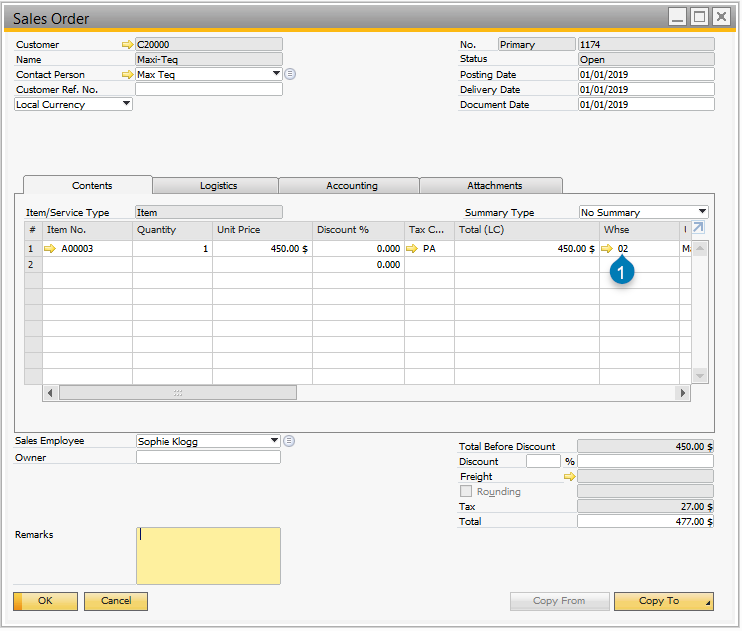 The selected warehouse setting can also be viewed in SAP Business One. At the document line level, the chosen warehouse is assigned to the line as submitted by the user (see marker 1 below). In B1, the Warehouse appears on the order document line (1). In this scenario, warehouse assignment is based on custom logic, and the assigned warehouse needs to be displayed to an employee during order placement. For example, a query is configured to determine the “closest” warehouse to the customer that has surplus stock. A query to select the warehouse. In this example: B1WebAPI_SU/Custom_DefaultWarehouse. This query may optionally use the parameter [%CardCode]. A query to list available warehouses. In this example: B1WebAPI_SU/Custom_WarehouseList. This query may optionally use the parameter [%CardCode]. This query must supply a list of value/label pairs, and must include all possible warehouses that can be assigned by the Default query. Properties (4): In this example, we are using the line-level warehouse field, with a list of warehouse codes/names for display on the web. Select the field Warehouse, ensure the Valid Values option is enabled, then select the customized query that was created in the first step: B1WebAPI_SU/Custom_WarehouseList. Active: Enable this option to display the field on the web. To see the field on the web, log into Employee Portal and add an item to the order. At this point, the assigned warehouse will be displayed on the line, as supplied by the custom queries. View the assigned warehouse and edit quantity. 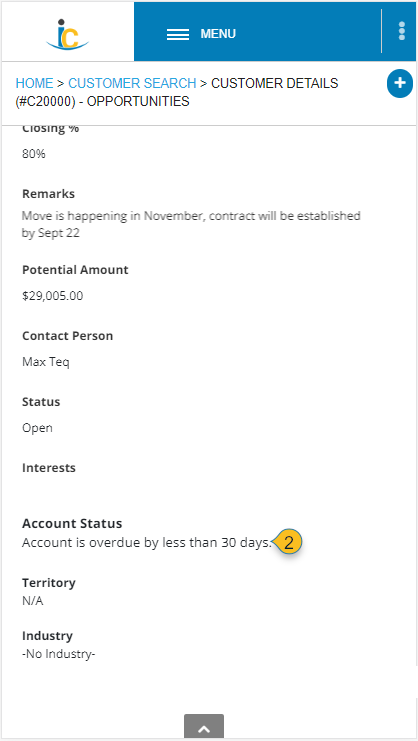 In this scenario, an account status is displayed at the top of the Business Partner Details or Opportunity Details screen. This message provides a sales person with an “at a glance” status message (for our example: “Account is overdue by less than 30 days”). 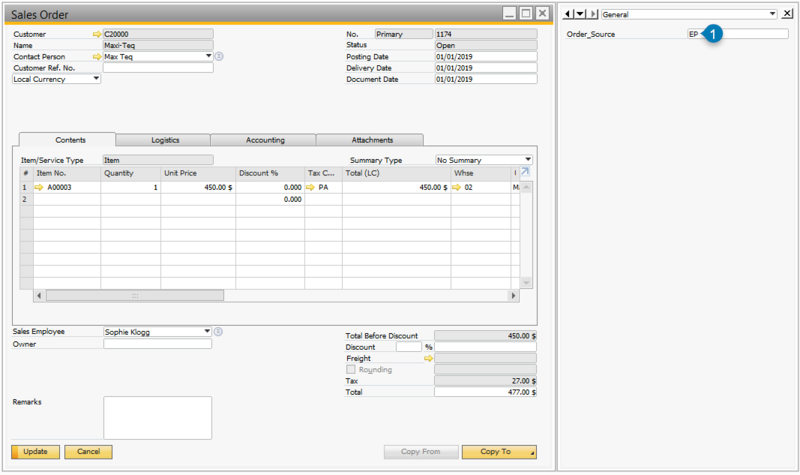 In SAP Business One, configure a query to select a message based on the customer [%CardCode]. In this example: B1WebAPI_SU/Custom_AccountStatus. Select Employee Portal > SalesUserBusinessPartner - Business Partner or Employee Portal > SalesUserOpportunity from the drop-down (see markers 1 & 2 below). Add or update the Account Status field (see markers 3 & 4 below). 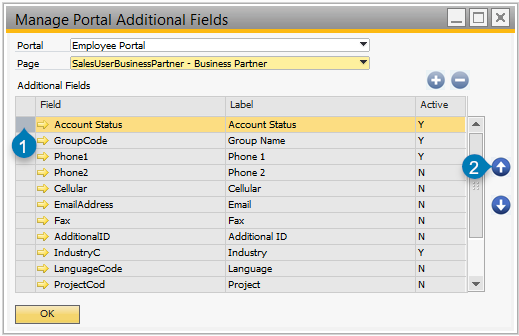 Select the Portal (1) and Page (2); Add a new field for Account Status (3) or Edit it if it already exists (4). Assign web Label (1), Type (2), Default options (3). Ensure the field is active (4). Active (4): Enable this option to display the message on the web. Move the field into the desired position. Shown below, the Account Status field has been moved to the top. Select the field's row (1); Use the Arrows to move the field (2). View the customer details (or opportunity details, as configured) on the web. Customer Details, with Account Status as generated by a custom query. Status Message (1). Opportunity Details, with Account Status as generated by a custom query. Status Message (2). In this scenario, it’s necessary to identify where an order was placed (on the web, within B1, or through some other process, such as orders taken by phone). 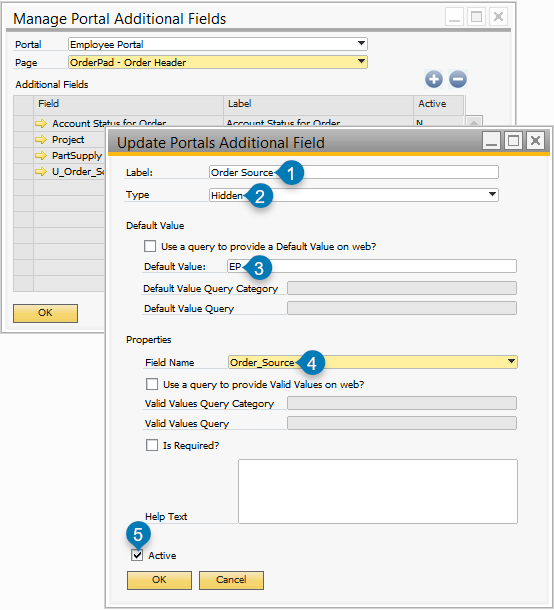 To facilitate this, a custom UDF on the Order Header can be created, which can then be updated from Employee Portal using a Hidden field. This type of hidden field can be configured as outlined below. In this example, we will use a hard-coded default value so no query is required. However, a query may optionally be configured if one is needed. This is outlined in previous examples. 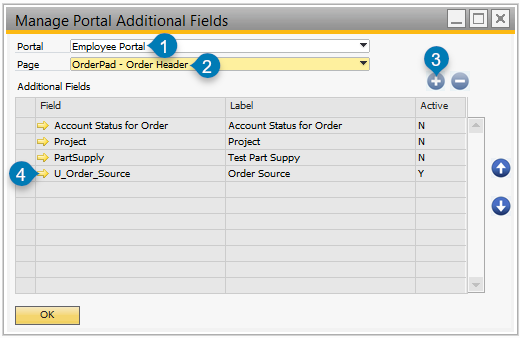 Select Employee Portal > OrderPad - Order Header from the drop-down (see markers 1 & 2 below). Add or update the Warehouse field (see markers 3 & 4 below). 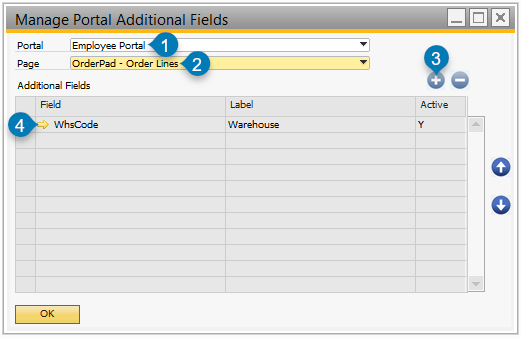 Select the Portal (1) and Page (2); Add a new field for Order Source (3) or Edit it if it already exists (4). Assign web Label (1), Type (2), Default Value (3), Field Name (4). Ensure the field is active (5). Label (1): Set this to Order Source. Note that because this is not displayed on the web, it is only visible to admins in SAP Business One. Default Value (3): In this example, we are using a Default Value. 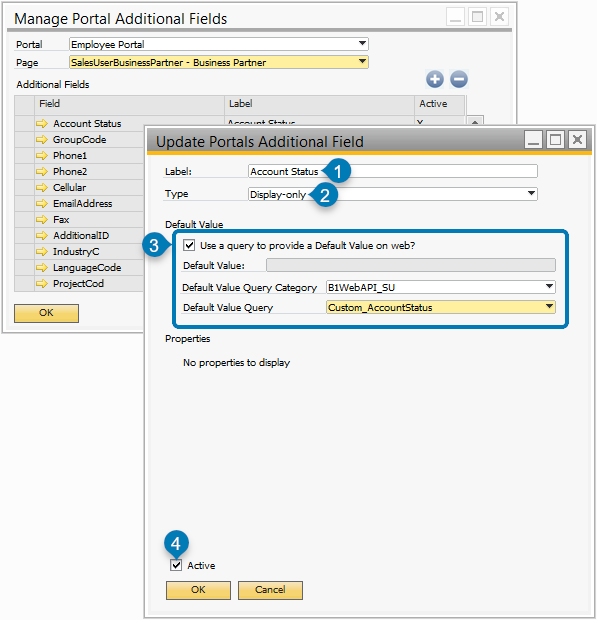 Set the Default Value to EP which identifies Employee Portal as the source. Properties (4): In this example, we are using a document header UDF called “Order_Source”. No other details are required. To see the field in B1, first place an order on the web: log into Employee Portal and add an item to the order. The UDF assignment can be viewed in SAP Business One. On the document, the UDF is set as determined by the custom query. (see marker 1 below). In B1, the Order Source UDF is set, as set on the web (1). Each page selected in the Additional Fields configuration screen has a specific subset of core B1 fields that may be configured, in addition to any UDF (User-Defined Field) assigned to that object type. 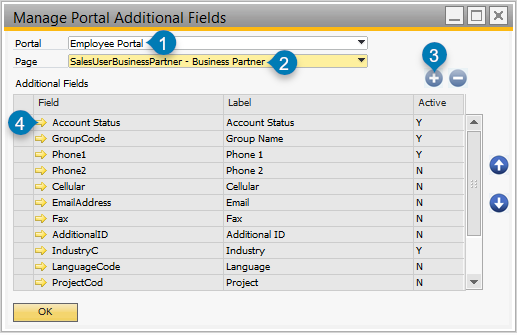 Core fields that come installed with Employee Portal are defined below. To configure an Additional Field for Order document Headers on Order Pad (including both Orders and Quotes), select OrderPad - Order Header from the Page drop-down. This configuration option is available in version 93.0 and higher. Any UDF UDF’s (User-Defined Fields) that have been applied to document headers may be configured. 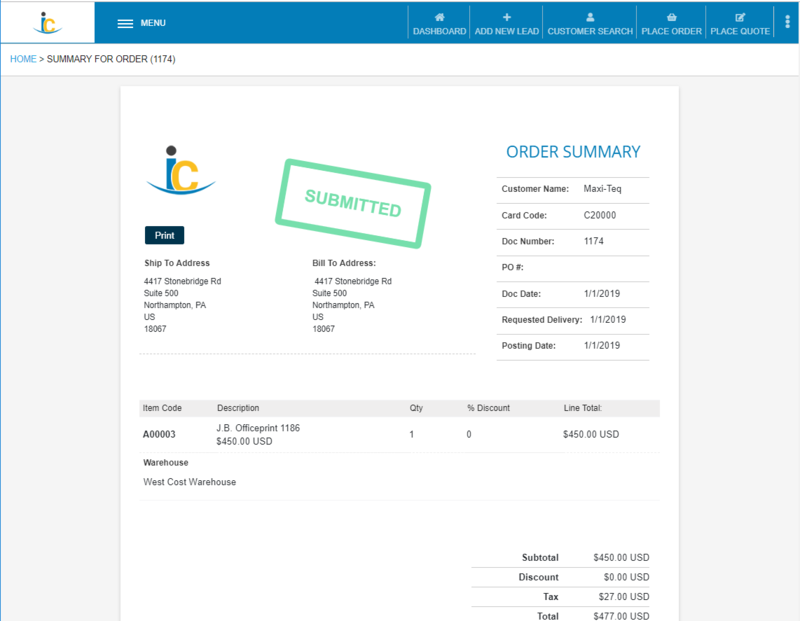 To configure an Additional Field for Order document Lines on Order Pad (including both Orders and Quotes), select OrderPad - Order Lines from the Page drop-down. This configuration option is available in version 93.0 and higher. Any UDF UDF’s (User-Defined Fields) that have been applied to document lines may be configured. No valid values are defined. To configure an Additional Field for Business Partner Master Data, select SalesUserBusinessPartner - Business Partner from the Page drop-down. Any UDF UDF’s (User-Defined Fields) that have been applied to Business Partner Master Data may be configured. AddID No valid values are defined. Cellular No valid values are defined. E_Mail No valid values are defined. EmailAddress No valid values are defined. Fax No valid values are defined. IndustryC No valid values are defined. LangCode No valid values are defined. Phone1 No valid values are defined. Phone2 No valid values are defined. ProjectCod No valid values are defined. To configure an Additional Field for Business Partner Contacts, select SalesUserBusinessPartner - Business Partner Contacts from the Page drop-down. Any UDF UDF’s (User-Defined Fields) that have been applied to Business Partner Contacts may be configured. Address No valid values are defined. LastName No valid values are defined. MiddleName No valid values are defined. Pager No valid values are defined. Title No valid values are defined. To configure an Additional Field for Business Partner Addresses, select SalesUserBusinessPartner - Business Partner Addresses from the Page drop-down. Any UDF UDF’s (User-Defined Fields) that have been applied to Business Partner Addresses may be configured. Block No valid values are defined. Building No valid values are defined. Country No valid values are defined. To configure an Additional Field for Sales Opportunities, select SalesUserOpportunity - Sales Opportunity from the Page drop-down. Any UDF UDF’s (User-Defined Fields) that have been applied to Opportunities may be configured. IntRate No valid values are defined.